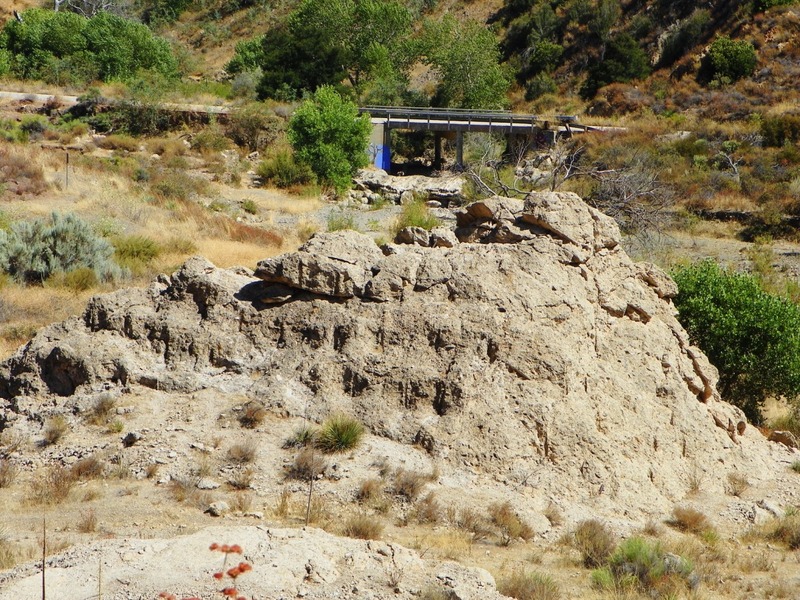 Here's a bit of a mystery for a friday night...what do you make of this outcrop? I missed it's significance when I was there looking at it. What do you think it might be? We are in southern California, somewhere in the San Gabriel Mountains. It sure looks like debris flow deposits. Maybe from intense orographic precipitation?? How tall is the outcrop? 10-15' x 30'? This is just a stab in the dark, but when you mentioned the San Gabriel Mts as its general locality, the thought crossed my mind that this might be the anorthosite, however a quick web search suggests that this is not the case. There appear to be drill holes on the surface of the outcrop, and their spacing and weathering condition suggests an older mining or quarrying operation at this site. I agree w/ SciGuy315 ... kinda looks like a chunky debris flow deposit. But, perhaps an 'old' one that is partially lithified. But the current shape of the outcrop is strange, seems like it's been molded into that shape by humans, which Ron alluded to. Rhyolite tuff? It's too pixelated to verify petrography and igneous origin. I was able to zoom in a bit more on my phone. What I can assess from lying supine on my sofa about 225 miles north of this out crop, is that it's masssive and granular with white "sand" at the base. I'm sticking with igneous, though intrusive rather than extrusive...let's say granodiorite. The most significant thing to my eye are the vertical tubes. Overall, the lithology looks to be a debris-flow deposit of some sort. I'm going to guess that the vertical tubes are moulds of a thicket of small trees that was inundated by the flow, then subsequently weathered out. If this is so, the debris flow would have to be very low-energy, otherwise such small trees would have been bent over or flattened. Perhaps the deposit was emplaced gradually, a few inches at a time, over weeks or months, during a very rainy period. So, how wrong am I?